Our first night at Base Camp was cold, based on the frozen water bottles in our tents the next morning. Well, this may have to be expected at that altitude and I am sure that we will experience much lower temperatures in the coming weeks. We took it easy on our first day at Base Camp and after an excellent breakfast and lunch we started to walk down the valley to the old Rongbuk Monastery. 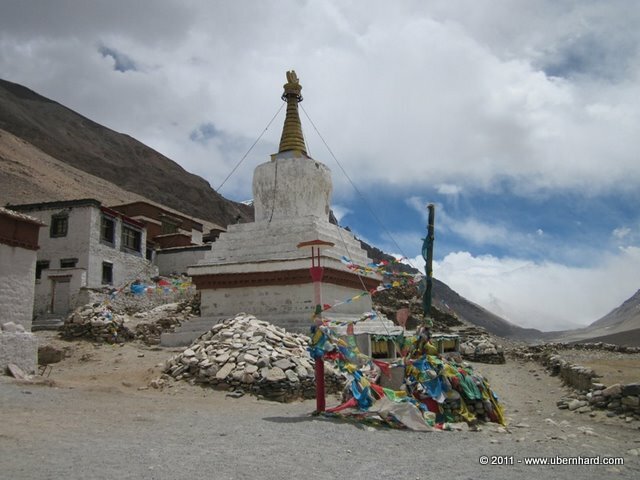 The monastery is about 10m/6.25miles north of Base Camp and luckily we got a ride for most of the distance. 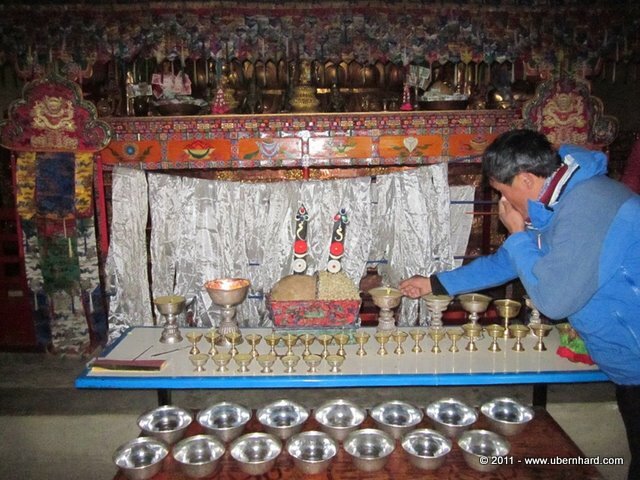 Once there, we visited a Lama in the monastery and our Sherpas received the insurance that he will pray for us as long as we are on the mountain. After this ceremony, we visited some other rooms of the old monastery including an over 100 year old Buddha statue. 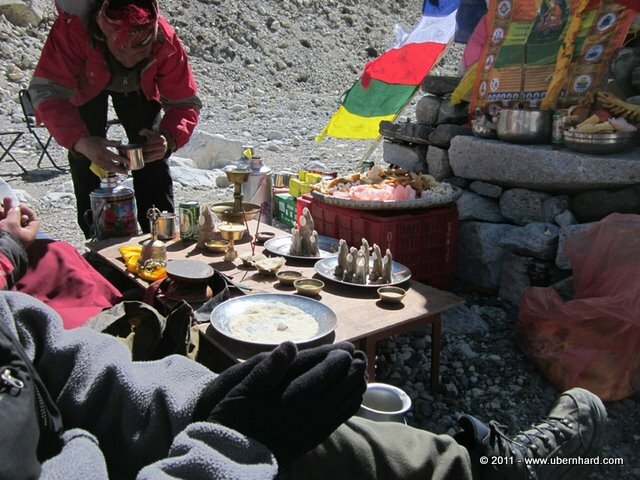 After all this we, we were invited to the tea ceremony and finally left the monastery on a trail back to Base Camp. Once again, it was a moving experience and it was good to see how important it was in the life for Lhakpa, Pasang and Rames, the three climbing Sherpas who will be with us on the high mountain. I really respect all these ceremonies and it really makes me feel to be part of an important journey. 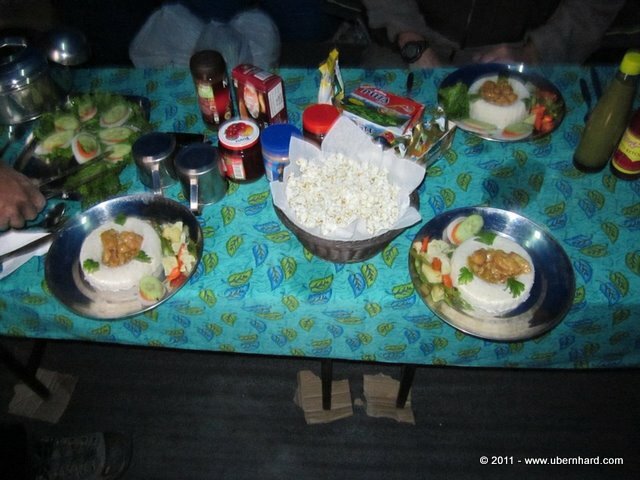 Once we were back in our camp, we enjoyed another great dinner and went to bed early. The next day, April 16, we left our camp around 8:30am for an acclimatization hike up a nearby mountain. It was not an easy hike up the rocky slopes but the view at each stop was so rewarding that we forgot the pain. Right in front of us were Everest, Pumori and Lobutche in all their greatness. We moved up to about 5,900m/19,470ft, an altitude which should help us to be well acclimatized for our hike up to Advanced Base Camp in a few days from now. Once back, we had lunch and relaxed the rest of the day in our tents or the Mess Tent. It was a beautiful day and relatively warm, as long as the sun was up. April 17 was a rest day. And what a day it was: there was no cloud in the sky and Everest was clearly visible in all its glory. Jim and I enjoyed the day, doing some washing, shaving and reading enjoying the warm sun. 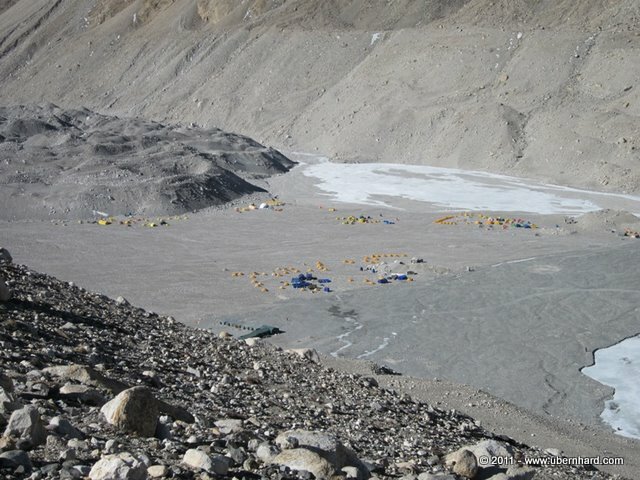 Soon we will be up at Advanced Base Camp and the temperature will change. Today we also watched many heavily loaded yak herds moving expedition equipment up the Advanced Base Camp (ABC). 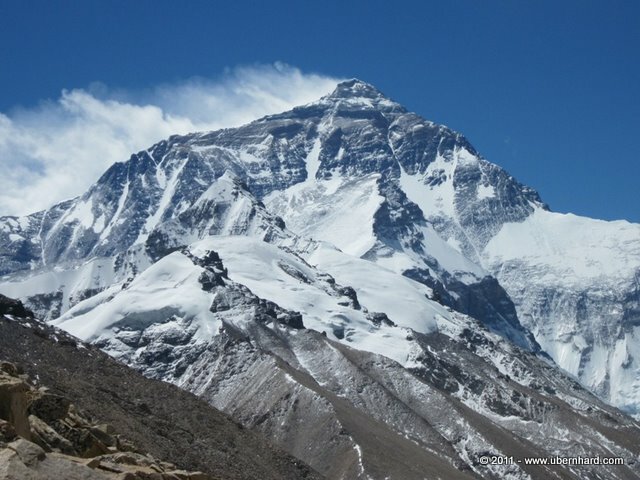 We will be loading our equipment on April 19 and move slowly towards Everest. Lhakpa and his team packed today most of our equipment and food in plastic barrels for the trip with the yaks. It needs a lot of planning and organizing and there are so many uncertain factors which have to be thought of. A big one is definitely the weather which can change in less than one hour and make travelling impossible. Today, April 18, was an important day for all of us. It was a cold and windy, but clear day. 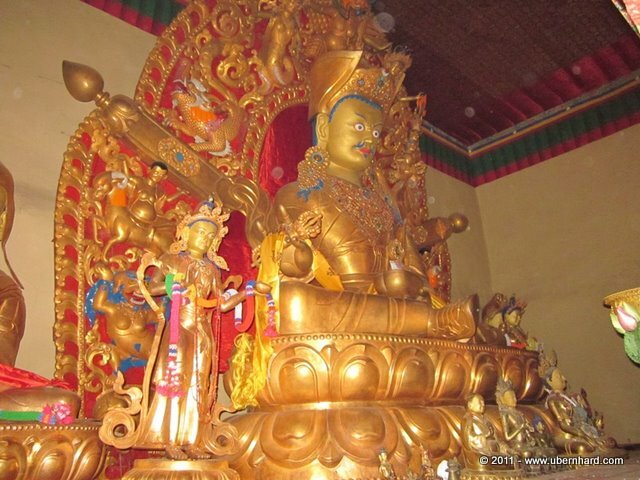 The Lama came up from the Lomgbuk Monastery to conduct the Puja ceremony. This ceremony is very important moment for most Sherpas. 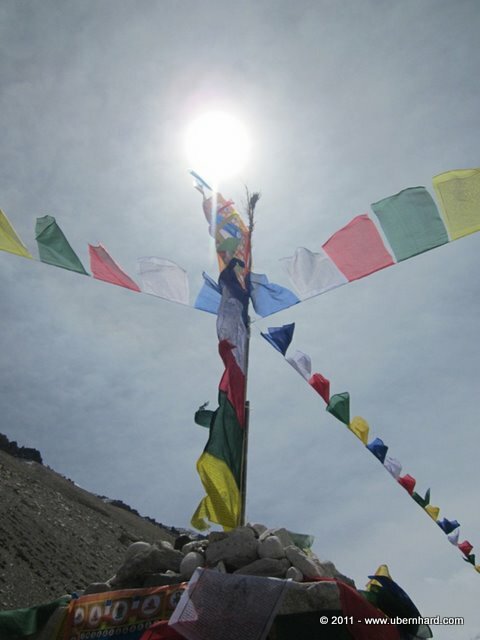 Their believe is, that it will protect the people who are going to climb Chomolungma, “Mother Goddess of the Universe”, how Mount Everest is called in Tibet. All climbing Sherpas as well as Jim and I had to bring our crampons and ice pick to the ceremony for the blessing. Once everybody was there, the Lama started with his praying, at times freely speaking, at times, reading from a text. Once in while he gently threw some rice over the food and the climbing equipment. There was a fire burning during the whole ceremony as well as some incent and a candle had to be protected from the strong wind. During the whole time Tibetan tea was served. I was deeply moved by all the symbolic activities and it was amazing for me to sit here among the Sherpas, listen to the Lama and looking at Mount Everest straight ahead of us. Really, it was an incredible feeling which made me think about why I am here. After the first part of the ceremony was over, the Prayer Flags had been released and attached in three directions. 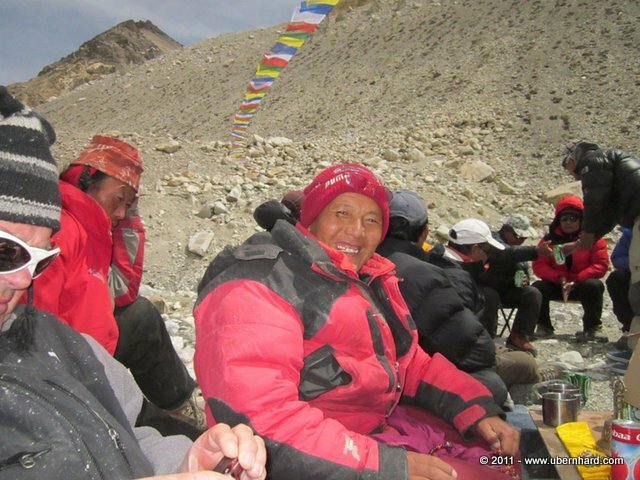 It was not an easy task for the Sherpas because of the strong wind. After the flag were up, we build a circle around the stone tower and received the personal blessing from the Lama. After all was over, everybody had a drink, different juices or beer. The whole ceremony really made me think about basic values, such as respect for the nature and live. It was a good feeling to be among so many Sherpas who show such a respect of the mountains and nature in general. There is much we can learn from them. In the afternoon the weather changed fast and it started to snow. For Jim and I it was time to repack all our equipment for our next move up Advanced Base Camp, at 6,400m/21,000ft, and in a hiking distance of about 22km/13.75miles. The plan is to stay about 10-12 days at high altitude, so it is important for us to make sure that we bring the right gear for this last acclimatization phase. 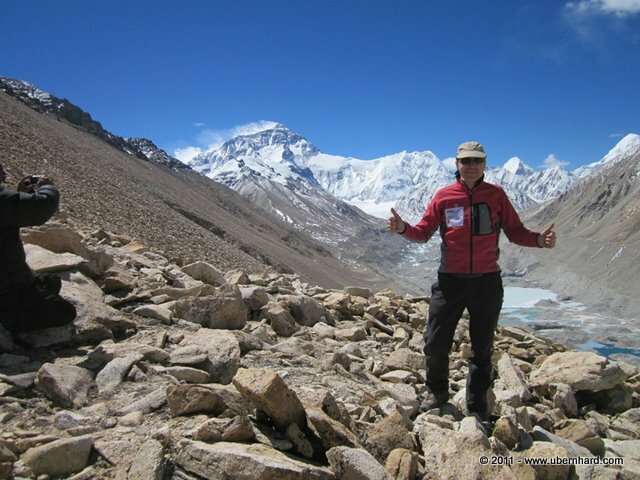 The highest we will go, weather permitting, is to Camp 2 at 7,500m/24,750ft. It will be cold and windy up there! After this climbing period we will come back to Base Camp to rest, eat well and wait for the weather window for a potential summit attempt in Mid-May. I may have no or only very limited possibilities to update the blog until we are back in Base Camp in early May.